PHB CPAs is a CPA firm located in Franklin, TN that specializes in individual income tax preparation for clients in Brentwood, Cool Springs, Franklin and Greater Nashville. Life changes pretty fast and with those changes come new tax questions. Get married this year? Move to a new state? Start a new business? You’ve come to the right place. 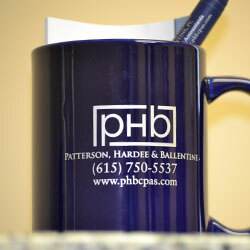 PHB CPAs is an experienced individual tax preparation firm in Franklin. We can help with all of your tax needs and make sure that you get every deduction available. Tax laws change quickly and our tax preparers are constantly updating their knowledge in all areas of taxation; whatever your question, we can answer it. We do much more than just individual tax preparation. We will be here to answer your questions during the rest of the year as well. Whatever your questions about your individual tax circumstances, we can answer them. Give PHB CPAs a call at 615-750-5537 to schedule a no-charge initial conference (up to 30 minutes) to learn more about our individual tax preparation services in Franklin and Greater Nashville.